The inaugural Matt Calvert Charity Shootout was a success as Calvert, from Brandon, Man. helped raise $50,000 for the Palliative Care Unit at the Brandon Regional Health Centre. Just over a month after hosting his first charity golf tournament, Matt Calvert was able to hand over a cheque for $50,000 to the Brandon Regional Health Centre Foundation Tuesday. 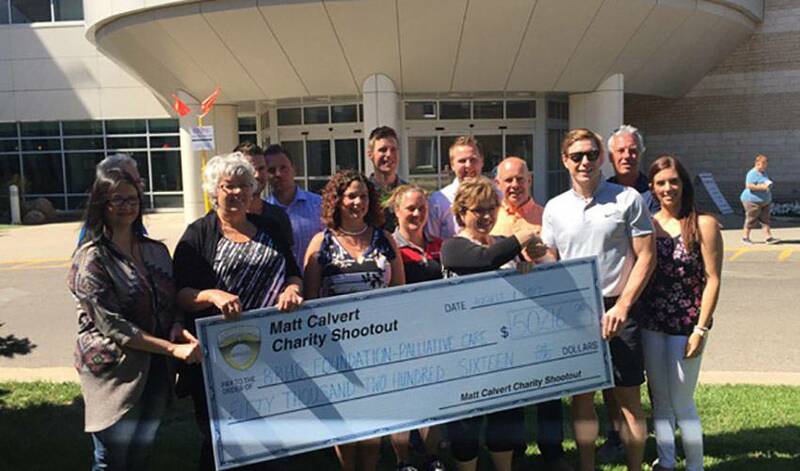 The inaugural Matt Calvert Charity Shootout took place June 22 in Calvert's hometown of of Brandon, Man. at Wheat City Golf Course. The donation was made in memory of two people very close to Calvert who passed away last year - his grandfather, Melvin Calvert, and Donna Hamm, mother of his close friend Kyle. All proceeds went to benefit the Palliative Care Unit at the Brandon Regional Health Centre. Having the event at Calvert's home town, where he also played for the Brandon Wheat Kings of the Western Hockey League for three seasons, seemed to be a natural choice for the 27-year-old whose community is close to his heart. "We love it here in the summer," Calvert told the Brandon Sun. "You never know where life brings you but we want to be a big part of the community, too." "Making it more comfortable for families being there in such a tough situation," Calvert said. "Whether it’s loveseats or TVs or whatever they end up doing with it, it’s just going to be great to see that." With 144 spots in the golf tournament and a banquet that hosted 400 people at the Victoria Inn's Grand Salon, the event featured dinner, raffles, an auction, and a special appearance by Winnipeg's own comedian Dean Jenkinson. Thank you to everyone who came out and supported the Matt Calvert Charity Shootout yesterday. It was a very successful day! If you're wondering about next year's tournament, it will be held at Wheat City Golf Course again on June 28, 2018. For more information, contact the Matt Calvert Charity Shootout Committee through Kyle Hamm (204-724-7624) or Scott Hellyer (204-761-1645).